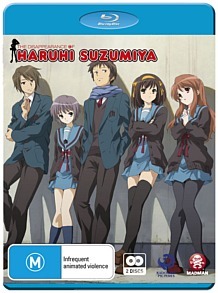 The Disappearance of Haruhi Suzumiya Review. All in all this is an excellent package, and an intelligent and unabashedly metaphysical take on the high school genre that will reward multiple viewings, not to mention interpretations. Now who could stumble across something like that and not be intrigued? I’d also read that those unfamiliar with the light novels would find the animated film’s storyline a little bewildering in places and after having watched it I would certainly concur, but allowing for this and one or two other provisos Haruhi does offer a multifaceted and rather intriguing viewing experience. The animation is strong without being anything out of this world (especially with recent Madhouse fare such as Trigun: Badlands Rumble setting the benchmark so high in this regard) although picture quality is pristine, and the voicework is also excellent on both the English and Japanese 5.1 TrueHD mixes. Another of the set’s real drawcards, aside from the solid feature itself, is the inclusion of over two hours worth of bonus content on a seperate disc, something of a luxury for anime fans this side of the pond. In this regard we are treated to multiple behind the scenes featurettes, commercials and TV spots, Stage Greetings from the Tokyo and Kyoto screenings, and more. All in all this is an excellent package, and an intelligent and unabashedly metaphysical take on the high school genre that will reward multiple viewings, not to mention interpretations.